To compete with Corona portables in the home market, Underwood responded with its own 3-bank portable in 1919. With their ingenious design, the Underwood engineers eliminated the need for a folding carriage while managed to get the machine down to the same size as the Corona No. 3. The result is a masterpiece of engineering in miniature and it is considered one of the easiest machines to type on. It originally cost $50. 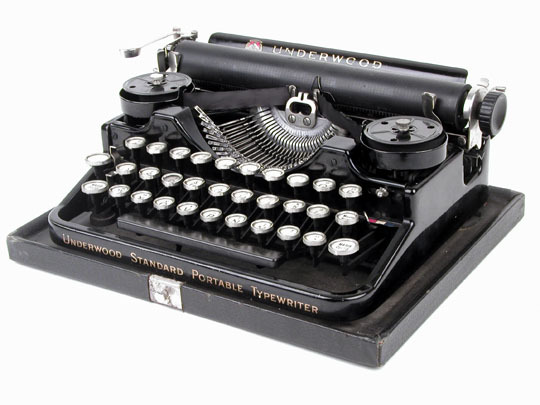 Underwood produced this model for ten years. This diminutive portable weights only 6 5/8 lbs without the case and the case dimensions are 12 wide by 10 deep by 5-1/2 high. In addition to the glossy black finish, some of the Underwood portables were in green wood grain finish. A must-have for collectors!